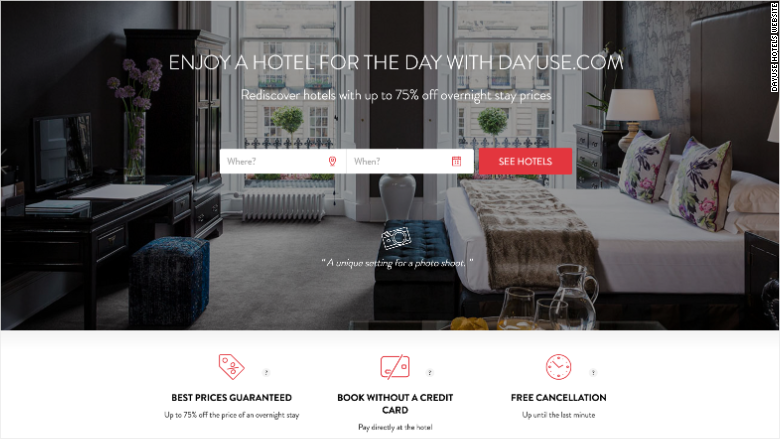 Top hotels in major cities around the world are offering daytime room rentals at cut-rate prices through tech startup DayUse.com. Need a place to crash for a few hours? Or a comfortable spot to host a business meeting? How about a quick luxury escape? Marriott (MAR) and the French hotel group Accor (ACCYY) have signed up with the service. The most recent deal -- with Hilton (HLT) -- was inked in late February. The website allows customers to rent a room for a few hours during the day for up to 75% less than a traditional booking. The French tech startup launched in 2010, and has since expanded to include roughly 4,000 hotels in 20 countries. Roughly 1,000 reservations a day are made using the platform. The new revenue stream is paying off for hotels. The site generated €20 million ($21 million) in bookings last year, double the level of 2015. David Lebée, the founder and CEO of DayUse, said that luxury room service and pool access are among the perks that customers can take advantage of. "For leisure, obviously there are couples," he said. But the service is also popular with business travelers and people transiting through major cities. These groups make up about 70% of DayUse reservations, said Lebée. Sony's music division, for example, has booked hotel rooms to host daytime interviews between its musicians and journalists, said Lebée. Business or pleasure? DayUse.com caters to a range of different customers. 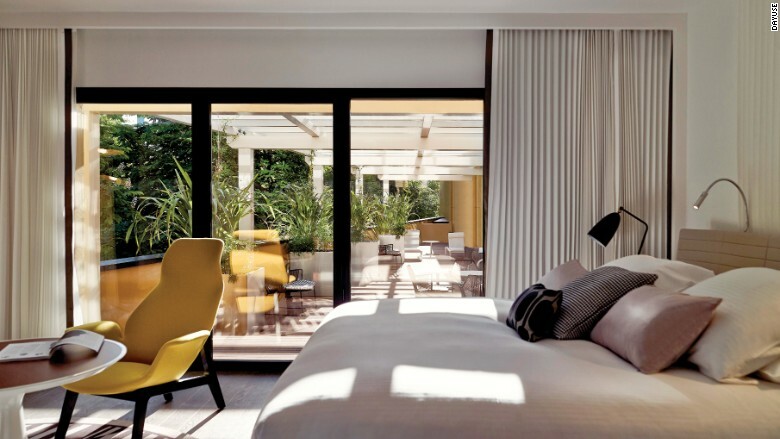 One Paris-based customer, Clémence Rebours, said she booked a hotel room through the site for a one-day business trip to London. This gave her somewhere quiet and comfortable to stay between morning and evening business meetings. "The good thing is, it's really calm," she said. "I wanted to work on my [meeting] presentation... I thought that a whole day at a Starbucks would be [bad]." Many of the hotels offered through the site are no-nonsense establishments near airports, but the platform also features hundreds of five-star hotels, including the Hotel Plaza Athenee in New York City and the Emirates Palace in Abu Dhabi. New York's Hotel Plaza Athenee offers daytime guests a 67% discount compared to its typical overnight rate. Guests pay $250 for a room from 9:00 a.m. to 3:00 p.m., instead of $750 for an overnight stay. And they're allowed to cancel bookings at the last minute for free. 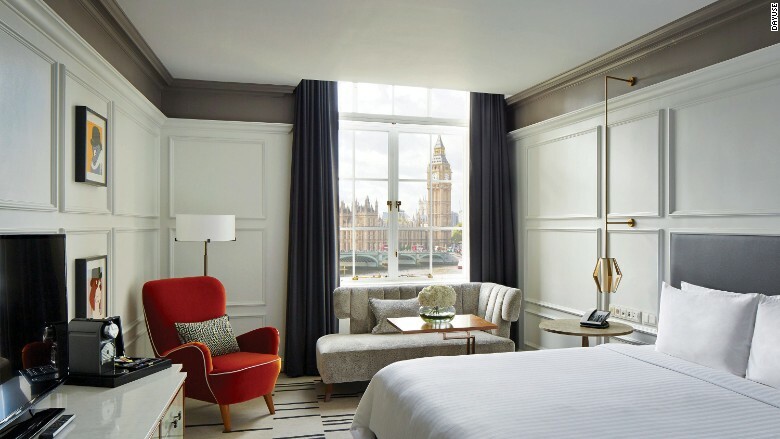 This Marriott hotel in London offers views of the Big Ben and big discounts to daytime clientele through DayUse.com. Lebée said this new offering helps hotels increase their sales by as much as 15%. DayUse gets a sizable cut from each booking, ranging from 15% to 25% of the price. The rising popularity of home rental websites like Airbnb have dented global hotel revenues as tourists have opted to stay in private homes instead of hotels. Lebée said his website can help hotels recoup some of their lost business. The hotel Molitor Paris offers steep discounts to daytime customers through the website DayUse.com. Paris is currently the company's biggest market, followed by London and New York. The French capital has been struggling with a tourism slump following a series of terrorist attacks. But hotels on the platform can make up some of their losses from DayUse bookings, said Lebée. From iConcierges to hotels by the hour, here are eight things you should check out before checking in! Are daytime hotels stays the lastest travel trend?